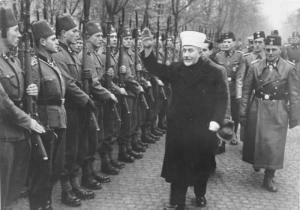 Nakba instigator Husseini giving the Heil Hitler salute to Bosnian Muslim volunteers to the notorious Waffen SS (the Hanzar SS Division) in November, 1943 [Jerusalem Post Archives] Delegitimization provides the sociopsychological rationale, the moral and discursive basis to harm the delegitimized group, even in the most inhumane ways… Delegitimized groups are rhetorically constructed as worthy targets of violence. The above is what we Israelis, as this volatile region’s most relentlessly delegitimized group, must keep uppermost in mind every mid-May. Whereas we celebrate our state’s Independence Day according to the Hebrew calendar, the Gregorian anniversary, May 15, is annually commemorated by Arabs as a day of lamentation for the Nakba. It’s the catastrophe according to their loaded terminology, which renascent Jewish sovereignty supposedly inflicted on the supposedly indigenous people of this land – the Palestinians.